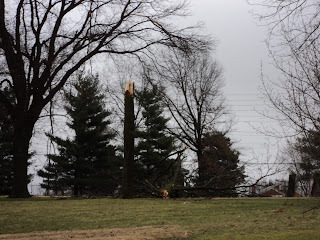 No major damage from the early morning storm that passed through the area but there were a couple of mid-sized trees that that were damaged. The view from the 11th cart path looking over toward #4. 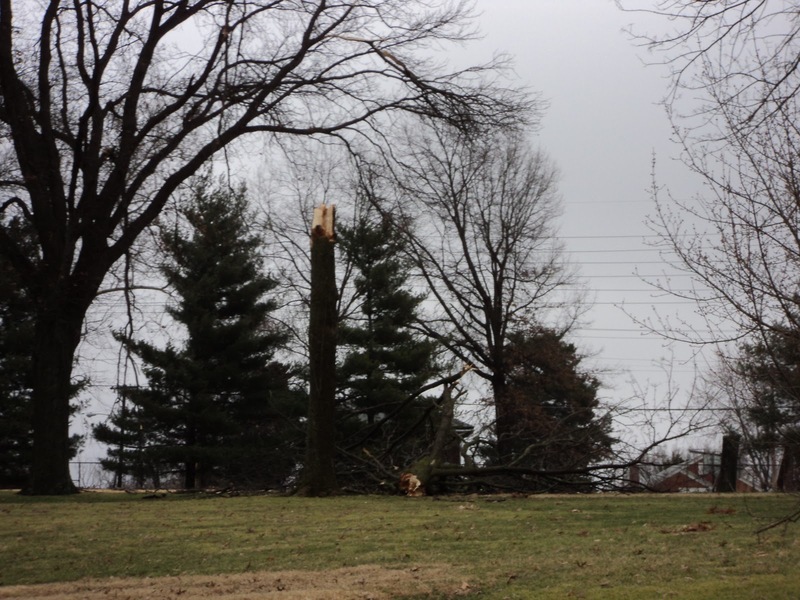 There was another small Ash on the right of #12 that was blown over as well. was snapped off. The tree should be ok for now. Chef Rob and his staff prepared our first small batch of maple sap over the weekend into Maple Syrup and it tastes yummy. Chef came up with the idea of boiling it down in his steam cooker. 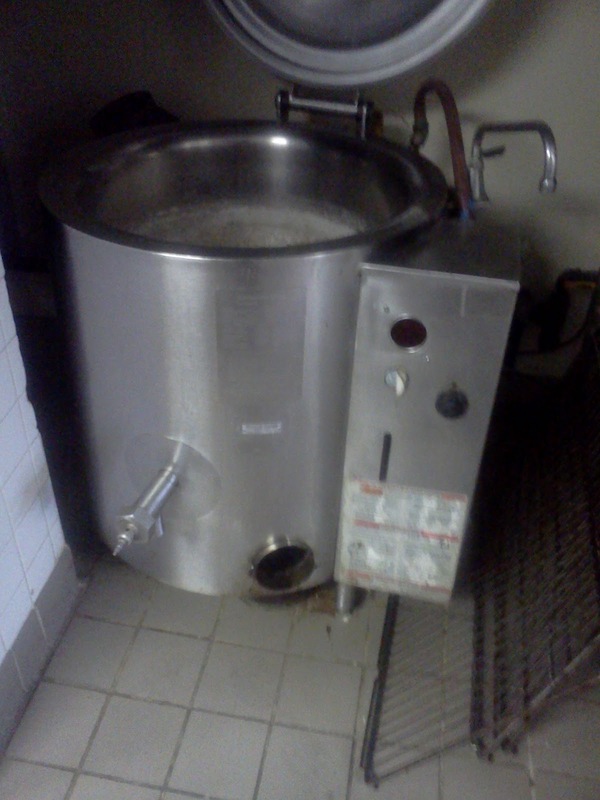 It can only handle about 15 gallons of sap at a time. As it boils down, you add more material to the cooker. Our sap production this year is very disappointing but at least we have enough material for the 40 Mile Wine Dinner held later this year. I expect we will have some additional sap drawn this week with cooler weather on the way so our members can enjoy some french toast or pancakes. You can see the remnants of the foam from the sap on the inside of the steamer. We only have a little over 1/2 gallon but the the taste is really good! 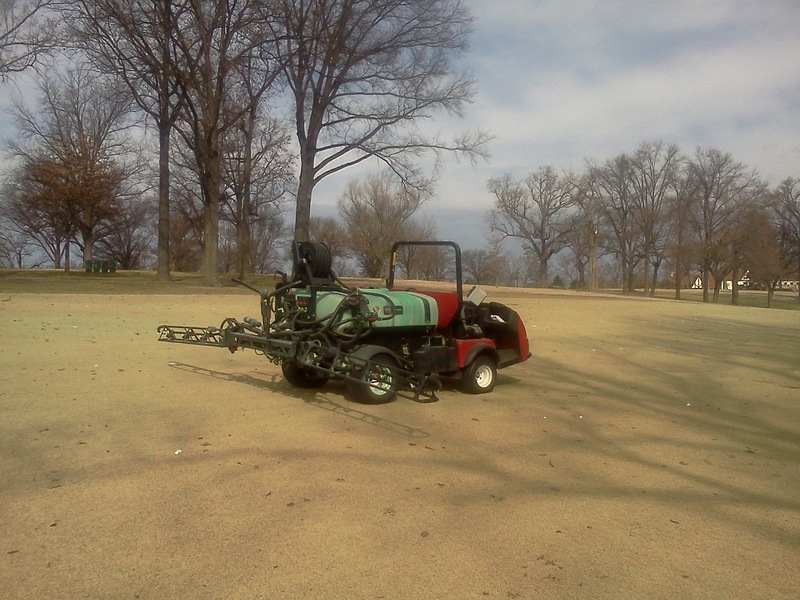 During the month of February or very early March, we apply our preemergent(Ronstar) and non selective weed killer(Round Up Pro) to our Zoysia areas of the golf course; fairways, tees and green surrounds that are solid warm season grass. We make the application this time of year because the Zoysia grass we are trying to protect is dormant and will not be injured from the spray. Round Up is safe to use only when warm season turf is dormant. We wait for temperatures to rise above freezing and sunny days. The chemical will move more readily through the plant if the conditions are warmer and sunny. Our first target we are trying to control is any cool season grass, mainly poa annua which has germinated in the fairway/intermediate cut/ tees and green surrounds. 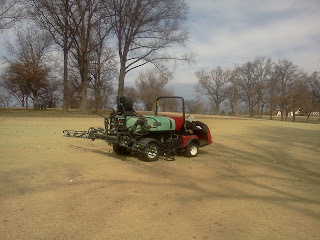 This application will also kill knotweed and will restrict the growth of rye, fescue and blue grass. If this material is not sprayed out, there will be large clumps of weed grass that seeds profusely and will leave our fairways very clumpy until we begin to mow in late April/early May. Our second target is to prevent crabgrass and goose grass from germinating in the spring and summer. We make this combination tank mix to to reduce wasting time and energy of a second application. This material will lay dormant on the surface of the soil until it is needed in the spring. This year, we are using Ronstar because it has the least negative activity on the root systems of our warm season grass. We had great warm season turf last year and I want to continue that push into this year as well. This material does cost more but it is wise to change chemistry's every few years to reduce the potential for resistance. We will be using Barricade on our rough areas in late March to early April along with a broad spectrum selective weed killer. Here's the spray rig after the tank was emptied this morning. 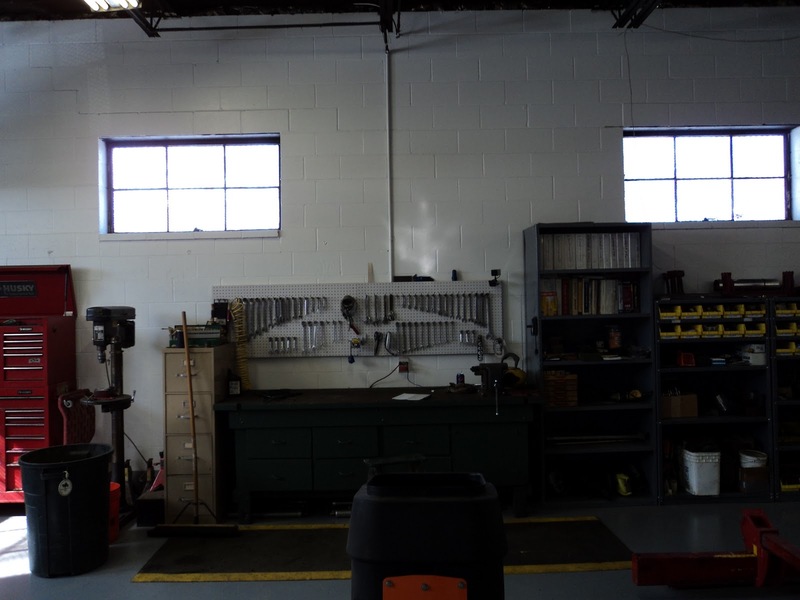 We utilize a soap marking system and some green dye to help outline the areas that we spray. This picture is along the right side of #18 fairway. 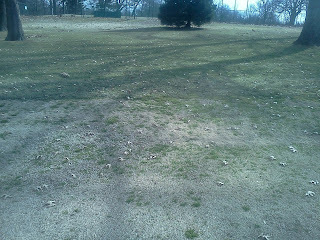 You can see how excessive shade encourages poa annua. Without the leaves on the trees, you can still see the affects of the shade. If the poa was not sprayed, it would begin to choke out the zoysia. 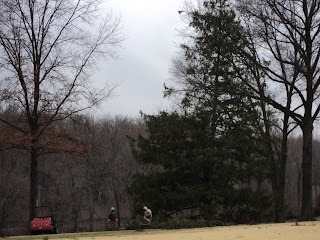 Our trees provide character for the course but also do encourage our poa annua population to explode. 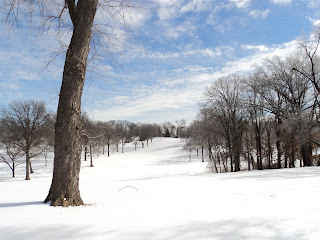 The course will be opening at 12:00 noon today. We will have to keep #11 green closed due to wet/soft conditions but the rest of the facility will be open. 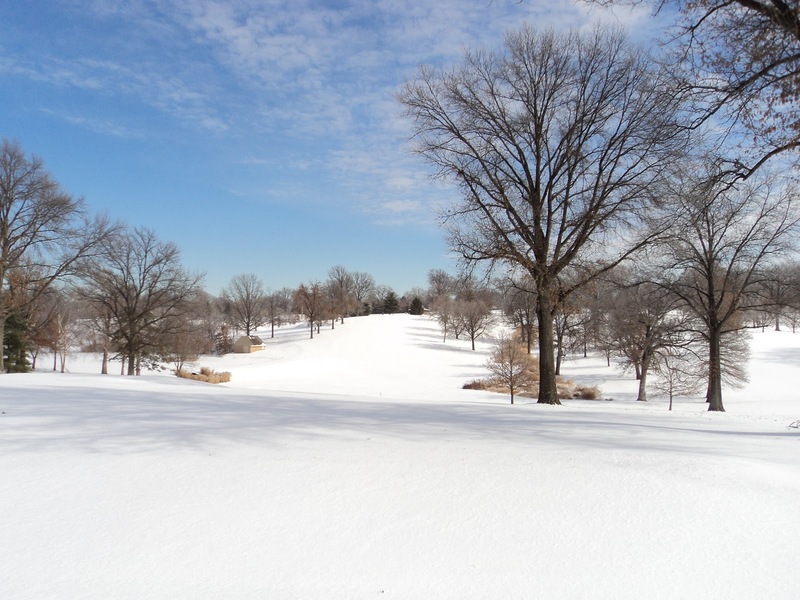 We appreciate your patience during this very warm weather while we allowed the greens to thaw which has allowed the surfaces to begin to firm up. We are doing a walk mowing on the greens today to get some of the winter fuzz/trash removed from the surfaces. We currently have white/blue markers set together and red markers are set out. Three ball washers will be set out on each side for your convenience. Once March arrives, all equipment will be placed out on the course. There is still some healing that needs to be accomplished over the next months on our greens. 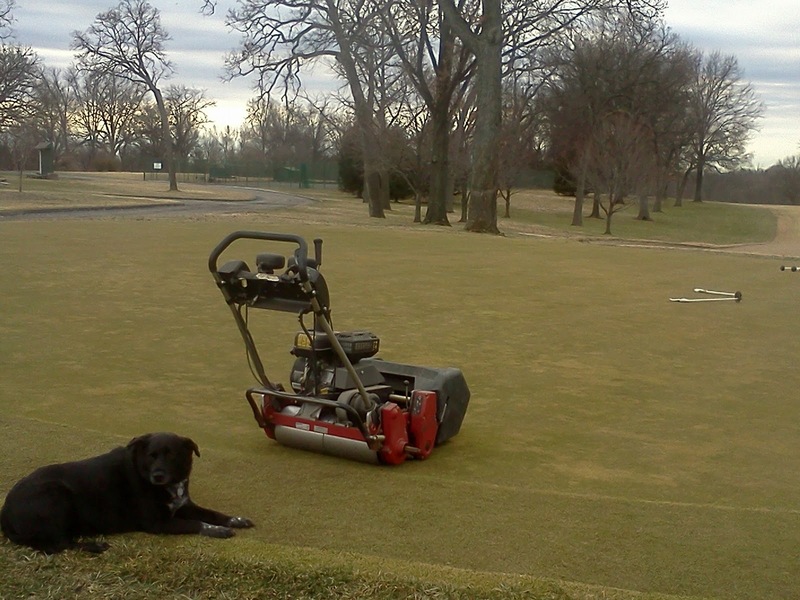 Some sanding/seeding and plugging will be done to encourage the areas to knit back into the complete surface you have been familiar with here at Glen Echo. Our core aeration in late March should help to finish the healing process as well. The break in the cold late last week was welcomed by all, including our maple trees which started to give off their wonderful sap which we boil down into maple syrup. Well, warm weather and temperatures that stay well above freezing are not very good for sap production. I just read about the process which is called positive and negative flow which is how sap flows up into the tree and water moves into the tree through the root systems. Pressures are created within the tree which controls the sap flow. The flow is controlled by temperatures that stay below freezing at night and go above freezing during the day. Not wishing for colder weather since we are in the business of members coming out and playing golf, I do wish for some near normal night time temperatures with some above average day temperatures for our members to enjoy the facility. We have a 2-3 week window to draw sap and we are running out of time. As trees get closer to setting their flower buds, the composition of the sap changes making it taste too bitter for maple syrup. 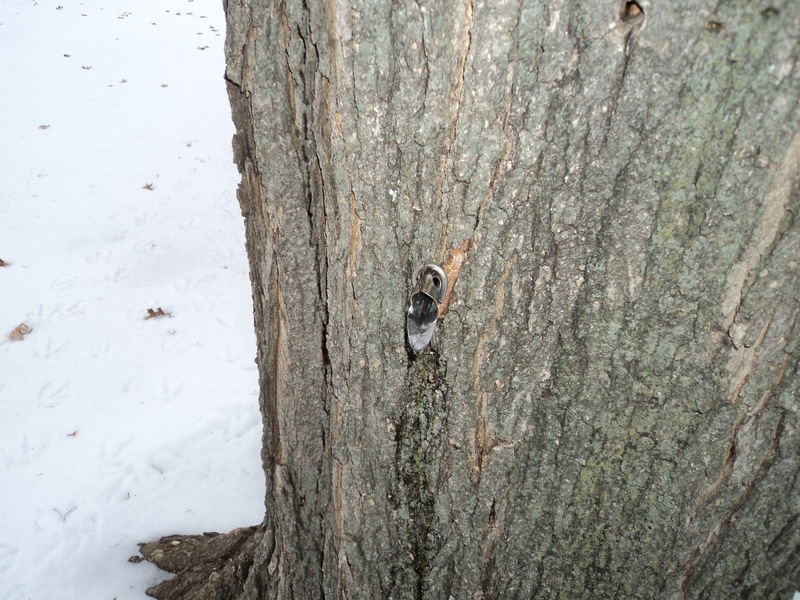 Article from last spring when warmer temperatures hit the northeast maple syrup production areas. I spent four days in Orlando last week attending the GCSAA's Annual Education Conference and Golf Industry Show. Click on the preceding link for highlights and videos regarding the show. As mentioned in an earlier post, I was also given the opportunity to make a presentation Friday morning. A lot of work but a great honor and thrill to be asked to present in front of my peers. The show encompasses educational presentations from university turf researchers, superintendents, motivation talks from nationally acclaimed speakers and the USGA. A 2 day trade show with vendors from services and all types of products used on the golf course. This conference is one of the highlights of my off season. Education, networking with my peers/vendors and enjoying some warm weather made for a great week. I also receive education points for attending the conference which is used to renew my Certified Golf Course Superintendent status every five years. The show raises my energy level and motivates me to get the season started even though weather can still be suspect for a few more weeks. I appreciate the opportunity that the club gives me in attending this great conference. 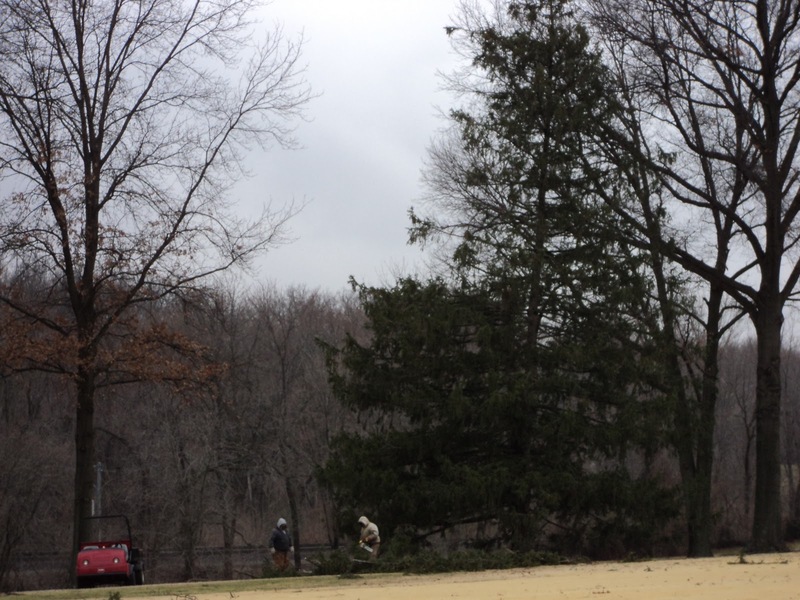 The Silver Maple from #14 tee was removed today. As you can see from the pictures below, it has seen much better days. This should provide a little more sunshine for the tee and give some help with water management. The roots of the tree grow well into the both tees of this complex. Tree consisted of a trunk and two large hollow branches. Tree was hollow almost to the ground. Jason cutting on the trunk. Tom and Jason cutting up additional sections of the tree. I was interviewed in Club and Resort Business Magazine a few months ago and it was published in the January 21, 2011 edition. Click the link above to read the full article. 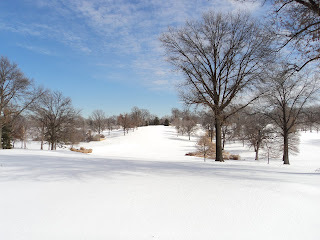 Snow left the course yesterday with the warm weather. Still allowing greens to thaw for another day or two. Will hopefully open Saturday but still evaluating each day. Hopefully this is the last time we have to go through this situation. The course remains closed due to snow, ice and various stages of greens that are thawing. I do not have an exact day that we will open but will be monitoring conditions every day. The long range mats will be open for those members who want to get some swings in during this nice weather. We have some greens thawing quicker than others but have at least 6-7 that have various forms of ice, snow and water on them today. The thaw is beginning to move through the profile. It needs to be at least 3-4 inches into the profile to allow the moisture trapped on the surface or just below the surface to move through before we will be able to open. 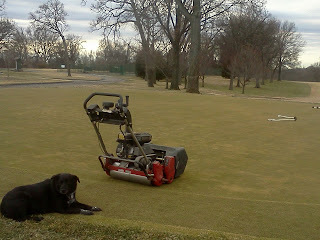 I am also concerned about root shearing which was discussed in the 'Keeper of the Greens' email blast sent out earlier. We appreciate your consideration during the thawing process. Additional posts regarding frozen greens from December and January. Probe used on the back of #1 green which only went into the surface about an inch. #2 green covered with melting snow and ice laying on the surface. Sorry for the short message earlier but my new phone would not bring the key pad up so I could type a message into this section while I was out of town. Still have to work out the kinks with the new phone. The maple sap has been flowing pretty well over the last few days. We will be making another 10-12 taps today to help increase our overall supply which should give us more syrup this year for our members to enjoy. 4 inches of snow again Saturday made for a beautiful picture or two I thought I would share for our snowbirds and our winter weather lovers. This was on top of the 4-5" of snow pellets from earlier in the week from the storm of the century! Well, its only been 11 years into this century. I guess if you were in the middle of the state it was the storm of all winter storms. This is from the 10" snowfall from January. The tables and chairs were set on the patio with the light and fluffy snow that fell. Measuring snowfall was easy on this day. 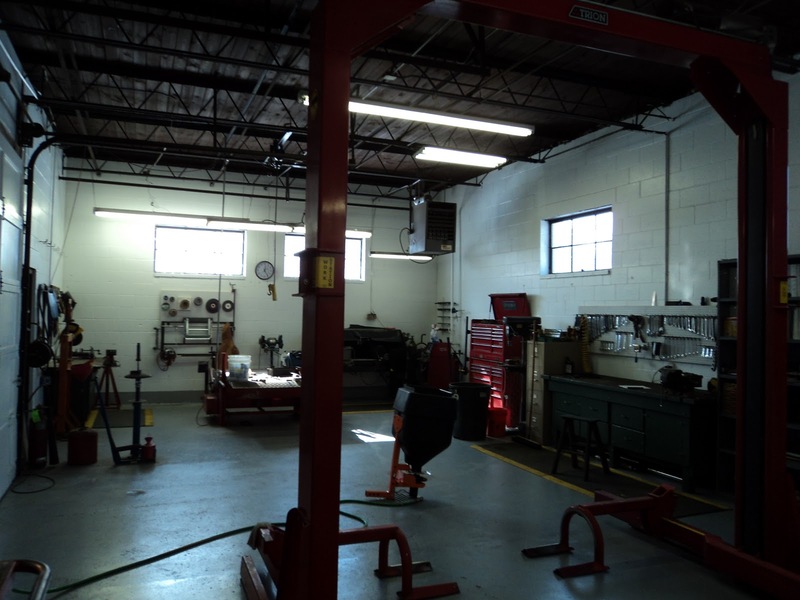 Its taken a few weeks to put the repair area back into service after tearing everything completely out, painting the floor, replacing old wood shelving, organizing the parts and supplies inventory and getting everything brought back into the area. 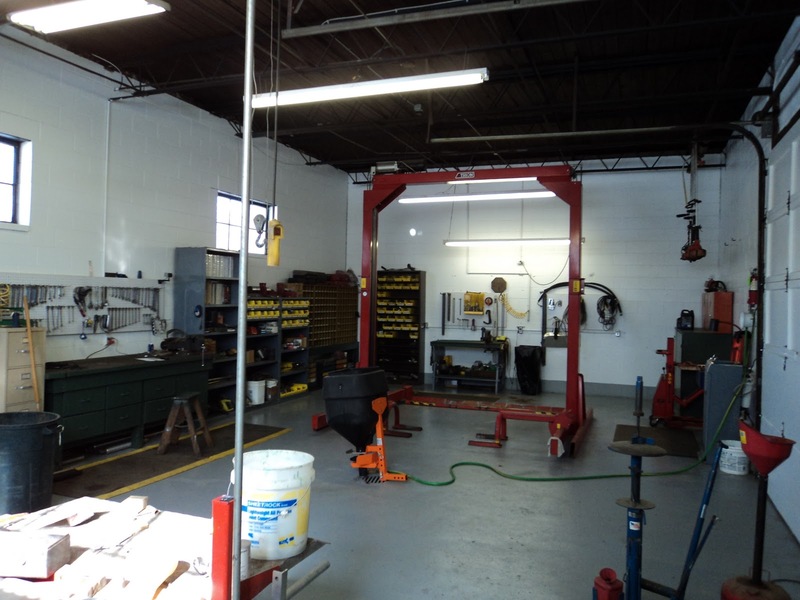 Shop is better organized and supplies are in more convenient locations. Grinder will come alive for the next few weeks. Leaving for a conference tomorrow and a couple of extra days of R & R. The weather forecast is calling for some above freezing temperatures before I return so I tapped about 10 maple trees today to catch some of that magic maple sap which will be flowing pretty quickly during the warm up. Cold day today but there was some sap flowing after a couple of days above 32 over the weekend. I will probably tap another 10-15 trees the middle of next week. When the sap is flowing heavily, buckets will need to be dumped everyday. Some trees flow more than others based on the size of the tree and the amount of material flowing up that 1/2" hole in the tree. Check out last year's posts for more information. 5/8" drill bit going about 1 1/2" into the tree. Tap placed into the tree. 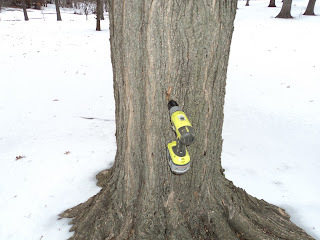 Sap running out of the tree right after drilling. 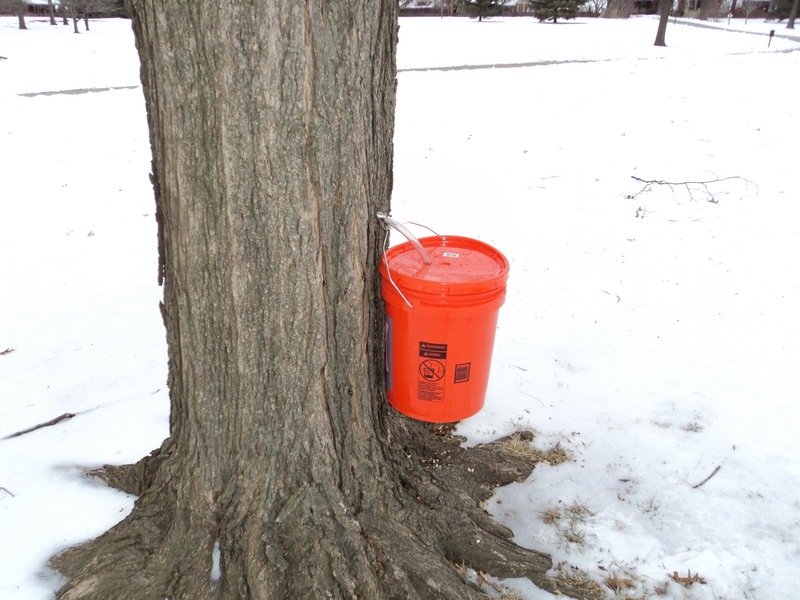 Buckets to collect the sap. 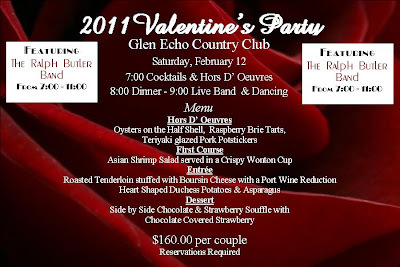 The 2011 Valentine's Party will be a fun event this year with great food being prepared by Chef Rob and his staff. Rob Stewart will have the clubhouse decked out for the party and has lined up one of St. Louis's best entertainers in Ralph Butler and his band. Beth and I have seen Ralph on many occasions. First year in a couple that we will miss this event due to being out of town but I hope many of you can attend this great evening of food, fun, and entertainment. 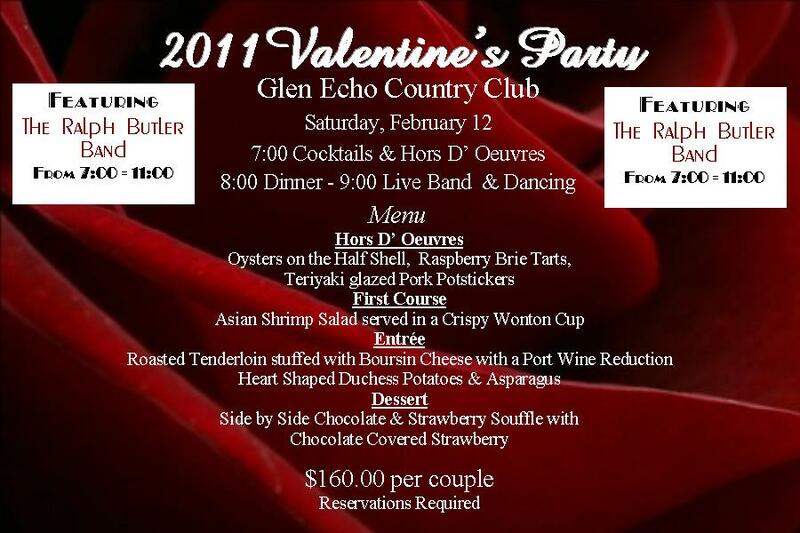 Call the clubhouse or go to the club website for reservations.